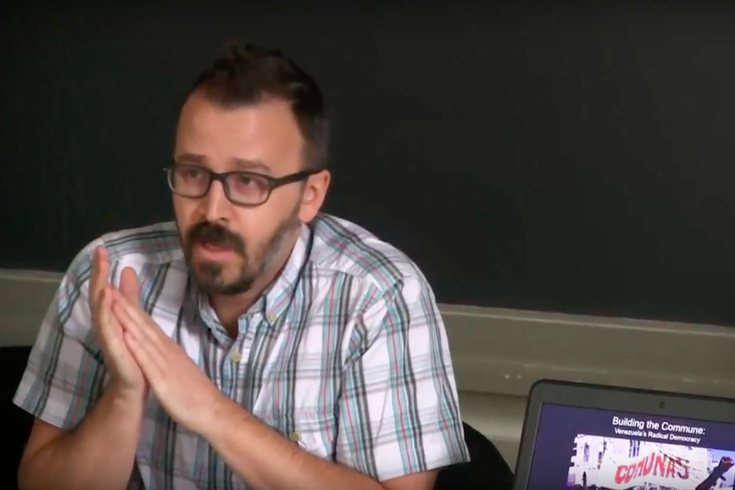 This screen capture shows Drexel University professor George Ciccariello-Maher speaking during a lecture at Cornell University in April 2016. The former Drexel professor now works at New York University. A college professor lashes out on social media with a caustic political opinion. Online commentators explode with outrage and demand firings. Does the university stand behind the instructor and accept a reputational beating? It depends both on the law and the fortitude of campus administrators. Fresno State University’s Randa Jarrar is the latest to incite condemnation with her stream of celebratory Twitter posts marking the April 17 passing of Barbara Bush. Jarrar denounced the former first lady as a “witch” and an “amazing racist.” For good measure, the English professor taunted her critics by boasting that tenure protected her from being fired. Jarrar’s situation isn’t uncommon. Professors from Kansas to Connecticut have provoked online outcry with incendiary posts about touchy social or political topics. What’s noteworthy is that Jarrar has toughed out the criticism and remained on the job. Social media firestorms often end professors’ careers. Last year, a Drexel University political scientist resigned after a flippant tweet that stated all he wanted for Christmas was “white genocide.” The tweet followed other comments in which the professor expressed disgust with the military and called white people “inhuman” for mistreating minorities. Around the same time, a visiting professor at the University of Tampa lost his job after tweeting that Hurricane Harvey, which killed more than 100 people, was payback for Texas’ support of Republicans. One difference is that, unlike Drexel or Tampa, Fresno State is a public university. And at public universities, the First Amendment limits the ability of supervisors to penalize distasteful speech. As researchers with the University of Florida’s Brechner Center for Freedom of Information, we’ve spent months digging into the rights of public employees when they speak with the news media. While Jarrar was publishing directly and not through a journalistic intermediary, the same constitutional principles protect her speech and that of all state employees – within limits. It’s well-established by decades of case law that the First Amendment prevents government agencies – including states that run many universities and community colleges – from restricting the content of citizens’ speech, or punishing them after the fact for what they say. When a private employer, including a private college, fires someone over a social media post, there’s no constitutional violation. At the same time, the U.S. Supreme Court has recognized that the government has valid interests in being able to provide services efficiently. As a result, employee speech that interferes with workplace harmony can be restricted or even penalized with a firing. So is a professor at a state-run college more of a citizen – or more of an employee? But more recently, the Supreme Court backpedaled. In 2014, the justices unanimously overturned the firing of an Alabama community college employee who blew the whistle on misspending at his state agency. Speech doesn’t lose protection, the court ruled, just because it is about information learned on the job. The First Amendment especially applies to comments about prominent political figures and political issues. To the relief of bloggers and talk show hosts everywhere, speech does not lose protection merely because it is insulting or mean-spirited. So even uncivil name-calling about the Bush family is difficult for a state agency to restrict. If Jarrar was tweeting as part of her job duties, she’d have no First Amendment protection; the speech would belong to her employer. But political commentary is probably beyond the job description for an English literature professor. So her tweets are entitled to at least some constitutional protection. And the First Amendment may apply even more forcefully when the speaker is a college instructor. DO PROFESSORS REPRESENT A ‘SPECIAL CLASS'? Outside of higher education, it’s become common to see public employees fired for caustic social media posts. Teachers, principals, police officers and firefighters have all lost their jobs for thoughtless excesses – whether real or perceived – on Facebook or Twitter. Even for employees of state or local government, legal challenges often fail. Employers can prevail by producing enough complaints to show that the speech upset workplace morale or undermined public trust. But in higher education, academic freedom is a cherished value. The term refers to the latitude that college educators are given to explore provocative ideas in the classroom, even unorthodox ones. In cases brought by professors in North Carolina and Washington, federal courts have given greater free speech protection to college faculty than ordinary government employees would enjoy. Stephen Salaita, a professor of American Indian studies, obtained an US$875,000 settlement in a lawsuit against the University of Illinois, when his job offer was withdrawn following outrage over his Twitter posts criticizing Israel. Salaita’s case shows how limited a public university’s options are in responding to indecorous speech by faculty members, particularly posts made on personal time about political concerns. Supreme Court Justice Louis Brandeis famously wrote in 1927 that the proper response to “evil” speech is “more speech,” not suppression or punishment. Like all government executives, college presidents can freely voice disapproval of obnoxious speech to distance their institutions from it. That’s just what Fresno State President Joseph I. Castro did. In informing the public that Jarrar wouldn’t be disciplined for her off-duty tweets, Castro disavowed the speech as “contrary to the core values of our University.” Castro is also holding two forums to air public sentiments about the Jarrar controversy. The Supreme Court has described college campuses as a “marketplace for ideas,” and the marketplace has largely disdained Jarrar’s choice of words. Social media speech is easily avoided, and remarks like Jarrar’s quickly dissipate if ignored. If the marketplace greets the next professorial online rant with a yawn and a click of the “unfollow” button, then the message will fail to find an audience – and the market will have spoken.